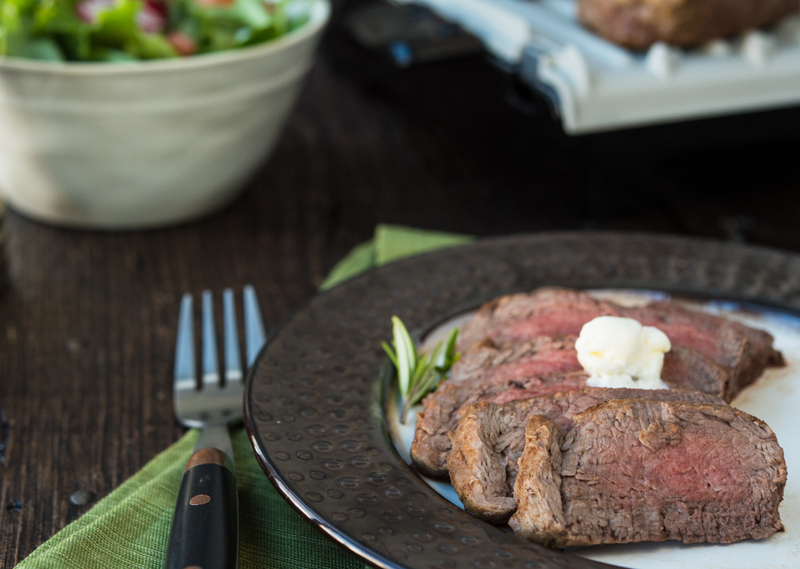 Seasoning these filets with a creamy bourbon honey mixture is sure to please your taste buds! Serve over a salad, with mashed potatoes or on its own. In small bowl, cream butter with hand mixer. Add in bourbon and honey. Mix until fully combined. Place butter mixture in airtight container and place in refrigerator. In small bowl, mix together steak seasoning ingredients and season both sides of each filet. Place filets on preheated grill and grill for 9-10 minutes for medium rare, or until filets reach internal temperature of 140°F. Carefully remove upper grill plate to exposer broiler and spoon 1 Tbsp. butter mixture on top of each filet. Cook on HIGH Broil for 1-1½ minutes, or until butter has melted. Remove filets from grill and allow to rest for 5-10 minutes before slicing. For the Indoor/Outdoor Grill, preheat grill to setting 4. Place seasoned filets on the grill and grill for 4-5 minutes per side. Top the filets with bourbon honey butter and place the lid back on grill. Continue to grill for about 1 minute, until butter is melted.